The Seventeenth Judicial District Commission on Judicial Performance unanimously recommends that Judge Craig Welling BE RETAINED. 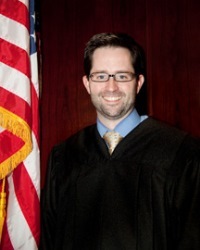 Judge Welling, a District Court Judge for the Seventeenth Judicial District, was appointed to the bench in 2010, and sworn in as a District Court Judge in 2011. Since that time, Judge Welling has presided over domestic relations, juvenile, civil and appellate (municipal court and county court appeal) cases. For the last year, Judge Welling’s work has been focused on juvenile and appellate cases. In 2007, Judge Welling began serving as chief legal counsel for the administration of Governor Bill Ritter, who then appointed him district judge in 2010. Prior that that position, Judge Welling worked in private practice. Judge Welling received his undergraduate degree from Colorado State University in 1995, his master's degree from Penn State University in 2001, and his Juris Doctor from the University of Colorado in 2001. Judge Welling keeps up to date on the law through reviewing appellate opinions from the Colorado Court of Appeals and Colorado Supreme Court each week, as well as through attending courses and conferences focusing on the types of cases his is presiding over. Prior to serving as a District Court Judge, Judge Welling did not have experience in Domestic Relations or Juvenile Law. To make up for the lack of prior experience, Judge Welling spent a great deal of time observing more seasoned judges in those areas, as well as studying those hard to understand areas of law. Judge Welling acknowledged the importance of communicating in a clear and understandable fashion, especially in the Domestic Relations and Juvenile courtrooms. It is Judge Welling’s philosophy that clear and understandable communication allows those who appear in front of him to understand his decisions, and also helps them to gain information to better avoid negative court involvement in the future. Based on its review of returned surveys, review of several of Judge Welling’s written decisions, courtroom observations, and an interview with Judge Welling, the Commission unanimously recommends that Judge Craig Welling BE RETAINED.